This Fujinon CF8ZA-1S lens has an 8 mm focal length for imaging larger areas from shorter distances. 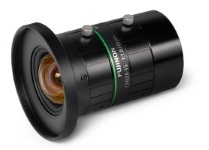 The Fujinon CF-ZA-1S series of machine vision lenses work well with 8 to 12 MP cameras built on Sony sensors. Sharp images are delivered to both 1.1" format sensors having 3.45 µm pixels, and 1.0" format sensors having pixels as small as 2.5 µm. Fujinon's High Relative Illumination design keeps the chief ray angle at less than five degrees. Light therefore enters all pixels more perpendicular to the sensor. The result is 90% relative illumination, or 80% as measured by the image sensor, with bright image corners. The 10G anti-shock, anti-vibration design ensures the lens can handle industrial environments. And the iris and focus thumb-screws are captive to keep them from getting lost. The thumb-screws can be moved to alternate locations to assure they remain accessible after the lens is mounted. Fujinon tests each lens's performance at the factory, and each is traced using a serial number.